"The Frugal Paleo Cookbook", by Ciarra Hannah, is a hit. If you are interested in eating low carb, or paleo, this is a great cookbook to add a little variety to your diet. 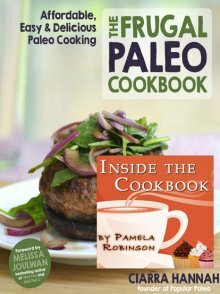 This isn't the book to learn about what paleo means or how wonderful it is for your body. To me paleo means real food. That is why I was so excited to see that the ingredients used in these recipes are found in most kitchens. Eating healthy does not have to be expensive. I don't like seeing things I don't know or can't pronounce going in my meals. The pictures are bright and a great addition to this book. The directions are easy to follow. I highly recommend adding this one to your collection.